The Big Sky Conference announced their 2018 All-Conference Football Team’s on Tuesday morning, and six different Thunderbirds were honored for their contributions during the most recent campaign. For the second time in his career, Zach Larsen was placed on the Big Sky’s First Team Offense. The All-American center has started every game for the T-Birds at center since his freshman year. Larsen was also named to the Big Sky’s First Team following the 2017 season, where the Thunderbirds claimed their second Big Sky Conference title. 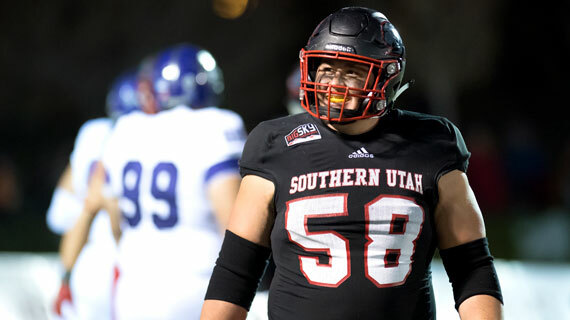 Former offensive lineman Marquez Tucker was named to the Big Sky’s Third Team Offense after starting every game for the T-Birds on the o-line this season. Tucker was a Second Team honoree following the 2017 season. Joining Tucker on the Big Sky Third Team as a kick returner is Judd Cockett, who was the first T-Bird to return multiple kicks for a touchdown in the same season since 2011 when Austin Minefee had two. Cockett took two to the house this season as well, with an average of 30 yards per kick return, returning 14 for 422 yards. This is Cockett’s first honor from the Big Sky. Chinedu Ahanonu made it to the Big Sky’s Third Team Defense, leading the team with 92 tackles this season. He also had 11 tackles for loss and two sacks for the T-Birds. Ahanonu was named to the Big Sky’s Second Team following both the 2017 and 2014 seasons for the T-Birds. Ahanonu wrapped up his career with Southern Utah’s as the team’s fourth all-time leading tackler. Both tight end McCoy Hill and linebacker Taylor Nelson were both given Honorable Mention status by the Big Sky, as both seniors have wrapped up their career with the Thunderbirds. Hill caught 32 passes for 270 yards and two touchdowns, while Nelson was second on the team with 83 tackles and 11.5 TFL. He also recovered four fumbles during the season.